It was another win for the market yesterday, but just barely. The S&P 500 edged 0.21% higher, still struggling with the weight of the impressive gains seen since late December. Dow (NYSE:DOW) led the way, gaining another 5% as investors continue to celebrate its split with DowDuPont (NYSE:DWDP). At the other end of the spectrum, Tesla (NASDAQ:TSLA) fell more than 8% following a first-quarter delivery report that was shockingly lower than its fourth quarter figures. Headed into the final trading day of the week, it’s the stock charts of Hartford Financial Services Group (NYSE:HIG), Freeport-McMoRan (NYSE:FCX) and Morgan Stanley (NYSE:MS) that are of the most interest. In mid-March, Morgan Stanley shares had proven they were range-bound. Although the bulls had proven they were willing to take their shot, they hadn’t proven that could actually get MS stock over the proverbial hump. On the other hand, at least Morgan Stanley stock was finding support in all the right places, remaining in the hunt for yet another breakout effort. The effort the buyers made on Thursday has pushed MS shares just a hair above a nagging resistance line and is challenging another one. One more good day could do the trick, although realistically speaking, Morgan Stanley will still likely need to fall back again before putting in the breakout effort that takes hold once and for all. • The technical ceiling that has been cleared is the $45 area, where MS peaked in January and again in March. 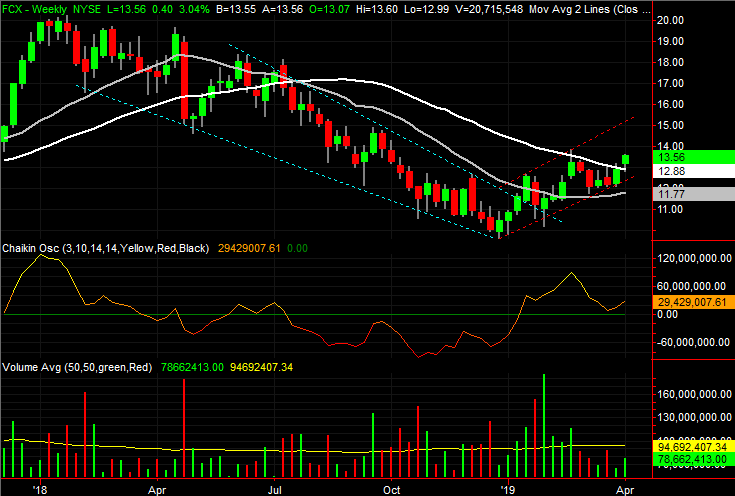 It’s plotted in yellow on both stock charts. • Shares of Morgan Stanley are also testing the white 200-day moving average line, but clearly paused there when put to the test. • Although momentum has actually been building for weeks, between Wednesday’s opening gap (highlighted on the daily chart) and waning volume on the way up, the bulls may need to slide back first and fill in that gap before punching through the big ceiling. The last time we looked at Freeport-McMoRan back on March 21, it had just pushed off of support offered by its 50-day moving average as part of the bigger-picture rebound effort that began in January. At the time, however, it wasn’t above the more pivotal line in the sand. That’s happened in the meantime. While it took some time and work, Thursday’s session cleared a huge technical hurdle. • That ceiling was the 200-day moving average line, plotted in white on both stock charts. It was resistance in February, but was unable to hold the buyers back this time around. 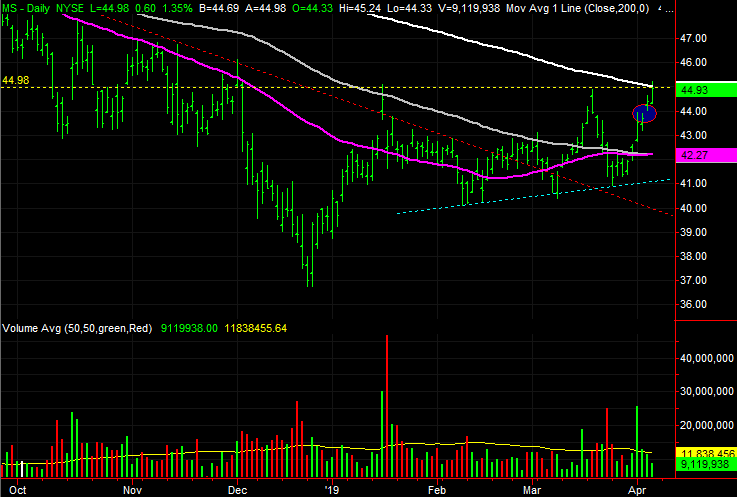 • Bolstering the bullish case are not one but two instances of support at the purple 50-day moving average line. 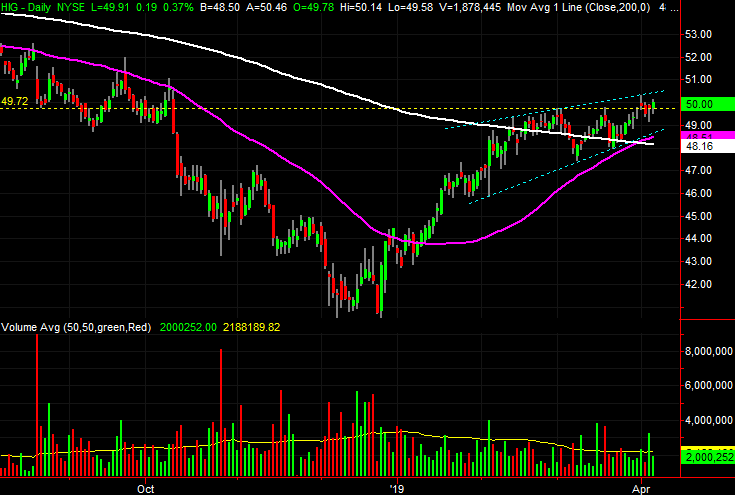 Each is highlighted on the daily chart. • Zooming out to the weekly chart, we can clearly see the downtrend that shaped most of 2018’s selling, framed by blue lines, has been broken, yielding to a new, bullish trading range plotted by red lines on the same chart. Like most other names, Hartford Financial Services Group enjoyed a fantastic January and February, erasing a miserable October through December. 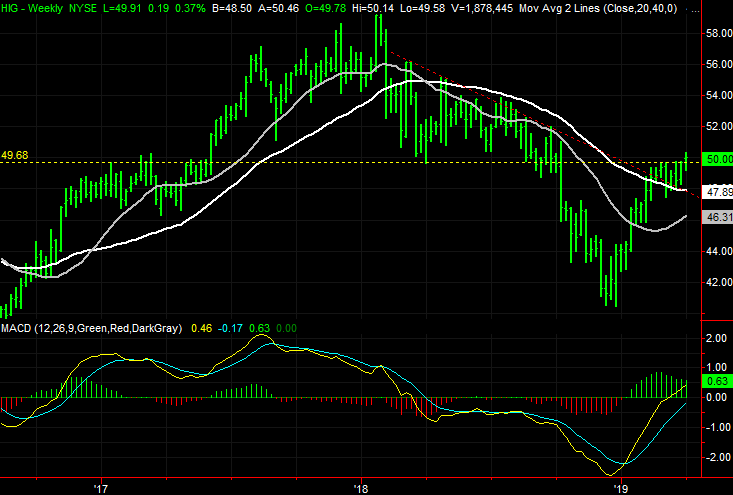 But also like most stocks, HIG stock has been stagnant since March, mostly moving sideways. That has changed this week though, and decisively so on Thursday. Shares are up and over a pretty big technical hurdle, and they’ve cleared it with some compelling underpinnings. • The hurdle in question is $49.70, plotted in yellow on both stock charts. That level had been resistance a few times over the past few weeks, but yesterday’s close of $50 puts in in the rearview mirror. 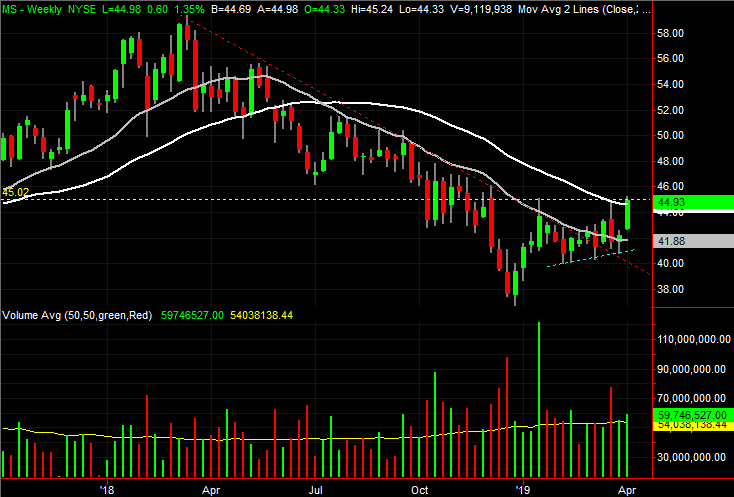 • Zooming out to the weekly chart we can see the $49.70 area has been a ceiling before, as well as support. 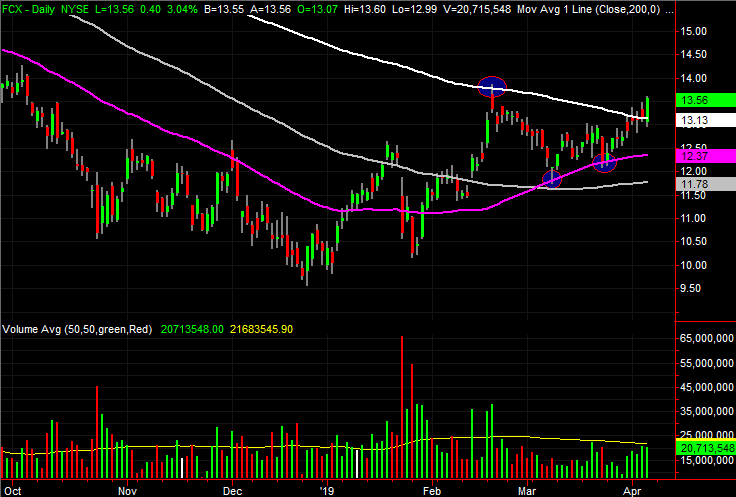 • The clincher is the “golden cross” plotted on the daily chart. That’s where the purple 50-day moving average line has crossed back above the white 200-day moving average, hinting at a new bullish uptrend. The post 3 Big Stock Charts for Friday: Freeport-McMoRan, Morgan Stanley and Hartford Financial Services Group appeared first on InvestorPlace.